A team of biologists and physicists at UC San Diego has uncovered in detail the dynamic process that allows the multi-tentacle Hydra, a tiny freshwater animal distantly related to the sea anemone, to open and close its mouth. The researchers report their findings in the current issue of Biophysical Journal. They say their discovery not only solves a long-standing puzzle of how Hydra feeds, but also enabled them to address a complex phenomenon in a living animal using relatively simple physics. Known for its ability to regenerate its body when ripped apart, Hydra must tear a hole through its epithelial tissue each time it opens its mouth. But the biomechanics of how it achieves this feat at the cellular level was unknown, basically because biologists couldn’t see it. This sequence of photos shows how Hydra can rapidly open its mouth to its fullest extent after only 13 seconds. 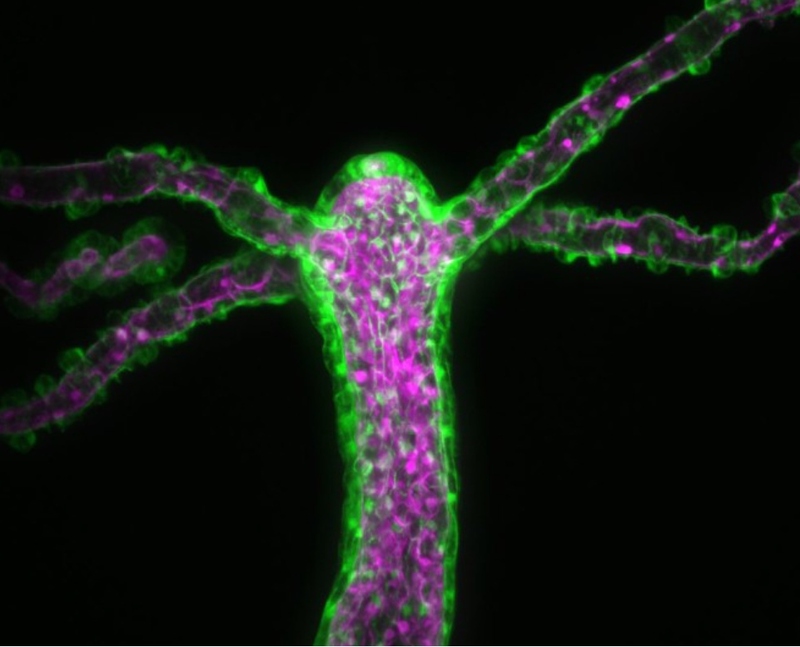 The de velopment of transgenic Hydra several years ago by Robert Steele of UC Irvine, however, has enabled biologists for the first time to track individual cells within the freshwater animal. Steele, who is a co-author of the paper, provided transgenic Hydra with green fluorescent and red fluorescent proteins tagged to cytoplasmic proteins in its ectodermal and endodermal epithelial cells, respectively. This allowed the team of researchers, which included UC San Diego biology master’s student Jason Carter and postdoctoral fellow Callen Hyland, to observe the cellular dynamics of the opening of the Hydra’s mouth for the first time. Because mouth opening involves major morphological changes, other biologists had suggested that in order to open its mouth, Hydra had to “rearrange” the positions of the cells between its tentacles to create and then expand the opening. But through live imaging, the UC San Diego scientists discovered that the process by which Hydra opened its mouth fully occurred on fairly fast time scales, on the order of 60 seconds. By tracking the position of the tagged cells and analyzing the changes in position, the researchers confirmed that the process did not involve rearrangement of cells. Instead, using shape analysis, they discovered that mouth opening was achieved through dramatic elastic deformations of the cells surrounding the mouth. The driving force responsible for mouth opening are radially oriented contractile elements called “myonemes” in the animal’s ectodermal cells, which basically act like muscles. This was confirmed experimentally by using magnesium chloride, a muscle relaxant, which prevented the mouth from opening. The scientists also found in their experiments that individual Hydra were able to open their mouths consecutively by different amounts, varying up to an order in magnitude in final opening area. However, by scaling each opening curve by its maximum opening, they found that the relative rate of opening was conserved, suggesting that the degree to which the mouth opens is controlled by nerve signaling. Collins said that because Hydra is such a simple animal and because it is able to regenerate after complete dissociation into individual cells, it offers researchers the opportunity to use similar techniques as the ones employed in their experiments to examine how an organism develops from an unstructured group of cells into a complex body plan. “We can now use this system to examine more closely two processes that are fundamental to all organisms: tissue formation and patterning,” she said.